I was originally given two days to come up with the idea for Why Do Fools Fall in Love. My agent at the time wanted to sell it as part of a two-book deal with Smoke Gets in Your Eyes. In the end, the deal with the proposed publisher fell through and I eventually signed with someone else. But this is how I came up with the story. I always start with a subject that interests me, and in this case it was the film industry. I knew I didn’t want to write about Hollywood, because the story would have been too glamorous, so it had to be the British film industry. I then needed characters. I liked the idea of two attractive men, who were complete opposites in personality, competing for the same woman. But who was this woman? I remembered the film the Bodyguard and briefly thought about having a female actress and a hunky male bodyguard. I dismissed that idea for being too obvious - but then had the idea to switch the sexes. What if I had a too-handsome-for-his-own-good actor, being forced to put up with a minder because wherever he goes he inadvertently gets into trouble? What if the female bodyguard was equally reluctant to take on the job - feeling she’s being forced to ‘babysit’ an actor who’s too stupid to duck when women throw themselves at him? Researching the book was remarkably easy. At the time I was living in a tiny village just outside Bath (a magnet for any production company wanting to make a costume drama), and I spent a day watching the BBC film A Respectable Trade. Although I came up with the idea over a couple of days, the book itself took a year to write and was eventually sold to Poolbeg Press. When the rights reverted back to me, I republished it as an ebook. It has now sold over 40,000 copies and spent over four months in the Amazon UK top 100. Not bad for a book thought up over a weekend! The Roman Spa, the Pump Room and the bridge at Priory Park are all real and open to the public. Shelby’s mother owns a riding stables and is supposed to be a huge fan of the movies. Shelby is therefore named after the Julia Roberts character in Steel Magnolias. Irving takes his name from the songwriter, Irving Berlin, who wrote White Christmas. They have two other brothers, Harrison (after Harrison Ford) and Cary (after Cary Grant), both of whom appear briefly in my other books. Their father owns several clubs and bars in the area, including the Parson’s Collar. Harrison works for his father; Cary works as a chef at the Smuggler’s Inn in Port Rell. The movie Ross and his team are making is called A Midsummer Kiss. It is based on a book written by Marina Grey, who is one of the characters from Smoke Gets in Your Eyes. 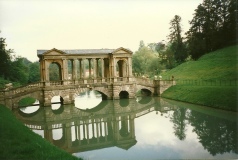 The interior of Ross’s house was inspired by Wilton House in Wiltshire. Paige Lorraine turns up again in A Girl’s Best Friend. Her disposition hasn’t improved! I took the title of the book from a very old song by Frankie Lymon & the Teenagers.